Simon & Schuster, 9781451659252, 272pp. This counterintuitive and powerfully effective approach to creativity demonstrates how every corporation and organization can develop an innovative culture. Want to be creative? Then think Inside the Box. The traditional view says that creativity is unstructured and doesn’t follow rules or patterns. That you need to think “outside the box” to be truly original and innovative. That you should start with a problem and then “brainstorm” ideas without restraint until you find a solution. Inside the Box shows that more innovation— and better and quicker innovation—happens when you work inside your familiar world (yes, inside the box) using a set of templates that channel the creative process in a way that makes us more—not less—creative. These techniques were derived from research that discovered a surprising set of common patterns shared by all inventive solutions. They form the basis for Systematic Inventive Thinking, or SIT, now used by hundreds of corporations throughout the world, including industry leaders such as Johnson & Johnson, GE, Procter & Gamble, SAP, and Philips. Many other books discuss how to make creativity a part of corporate culture, but none of them uses the innovative and unconventional SIT approach described in this book. 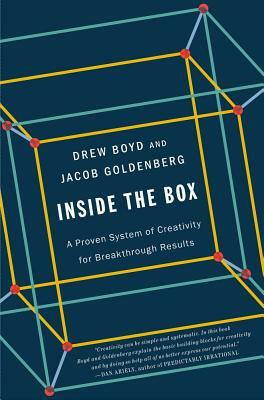 With “inside the box” thinking, companies and organizations of any size can creatively solve problems before they develop—and innovate on an ongoing, systematic basis. This system really works!